The Emerald Ash Borer (EAB) is a small, lovely beetle (0.4 inch) that is exquisitely colored metallic emerald green with a striking bright red upper abdomen when its wings are spread. Unfortunately, this beauty runs only cuticle deep. It is native to eastern Asia where it feeds on various Asian ash species. 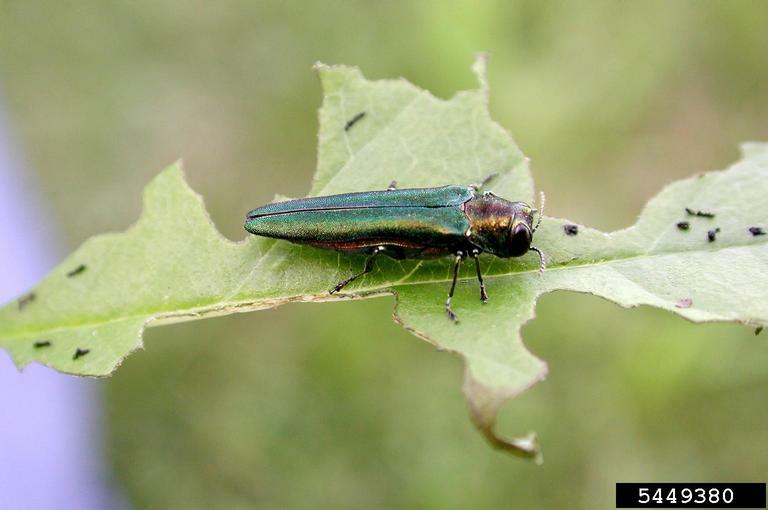 In its native habitat, the EAB is found in low densities and is not considered a pest. Unfortunately, in North America this beetle is highly attracted to our native ash species and readily de-toxifies our local ash’s defensive compounds. Without natural predators to control this pest, it is a lethal combination. All North American ash species fall prey to the EAB including our local green, black and white ash trees. First found in Michigan in 2002, it appeared in Ewing, NJ last year and is now one of five sites where this insect has been found in NJ. The presence of this insect is currently being monitored by the NJDEP, and this region is now under quarantine restrictions for all local ash products including fire wood and lumber trees. Sadly, there is no particularly good way to control the pest at this time. Beetle larvae are the principal damaging stage where they feed under the bark on the tree’s sap conducting tissue. Eventually, the tree canopy is cut off from water and nutrients, killing the ash over a period of a few years. Soil drench and injectible insecticides have been applied with varying results against this pest. These treatments may delay death several years but generally do not rid the ash of this pest. Biological controls are also being aggressively pursued by the USDA. Between 2007 and 2015, three Asian biocontrol agents gained approval for release. In addition, scientists are attempting to control the EAB using an indigenous insect fungal pathogen. At this time, using this biological control strategy has not been shown to work. Our current method to deal with EAB infestations and to prevent its spread is by cutting the tree and burning the wood to destroy the beetle larva. The reality in Ewing is that we will lose many, if not most, of our ash trees. No viable control agents have yet been found at this time. We are concerned by the consequences of such a great loss to our environment at multiple levels. For example, NJ is attempting to attain a 40% tree canopy coverage throughout the state while Ewing Township is currently struggling to maintain a 28% canopy coverage. We can ill afford to lose such an important tree in our environment. In addition to the physical loss of trees, these trees support a diverse array of insects specific to Ashes which support our birds, mammals and other wildlife. For example, over 29 families of moths alone (some with multiple species) depend on ash trees. Many additional species of beetles, parasitic wasps and other insects similarly depend on ash trees for their habitat. Losing these trees will diminish the richness of our environment. Currently, we are recommending that infested (and removed) ash trees be replaced with resistant, native trees such as maples and oaks. For additional information and details about the extent of the EAB problem on Ewing municipal lands, please check the EAB Rapid Ash Survey Report and Management Options prepared by the Rapid Ash Survey Team (RAST) (description follows) from October 2015. Rutgers Urban Forestry Program and NJ State Forestry Services partnered to conduct a rapid survey of ash trees in several NJ municipalities. The goal of this effort was to get an idea of how extensive the municipally controlled ash tree population is throughout NJ, in order to better understand the financial and environmental impact that Emerald Ash Borer will have on NJ municipalities. Ewing was selected for inclusion in this ash survey due to its size and location.